Mehdi Ghadyanloo is an Iranian artist and muralist who gained great recognition and praise in the recent years. 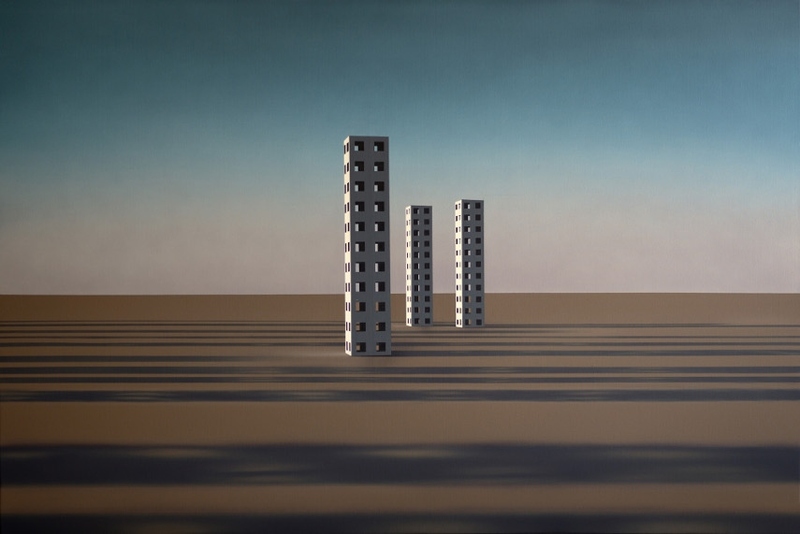 His main works were paintings done in a Surrealist manner with an otherworldly and silent atmosphere, rendering architectural landscapes and images and reflecting on philosophical and existential themes. Later on, he started being very successful in doing mural paintings in a bit lighter and more radiant style. One of his hallmarks is defying clichés of Muslim art usually grounded in calligraphy and geometric patterns He creates a harmonic fusion of his Persian heritage, tradition, and culture with strong western influences and routines. Ghadyanloo was born in Teheran, Iran in 1981. While growing up, he lived at the farm in the time of war with Iraq – experience that had a lasting effect on him, and that can be traced in his art in the senses of uncertainty, loss, and reprieve. Representing the feelings of his whole generation Mehdi Ghadyanloo created a unique voice of hope, love, and melancholy. Ghadyanloo’s wistful and poetic work has a Zen-like tone, by which he manages to encompass the notions of only national identity and bring his art to a higher universal level. Yet, there is always something mistily threatening – it is not clearly depicted, one cannot point a finger to it – but, one almost certainly feels something ominous under the veil of the eerily beauty. 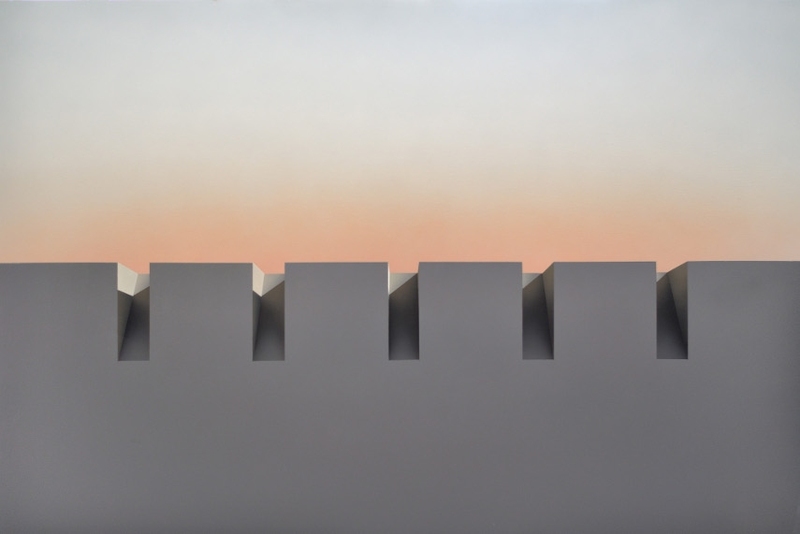 In his use of light, Ghadyanloo resembles the artist David Hockney. 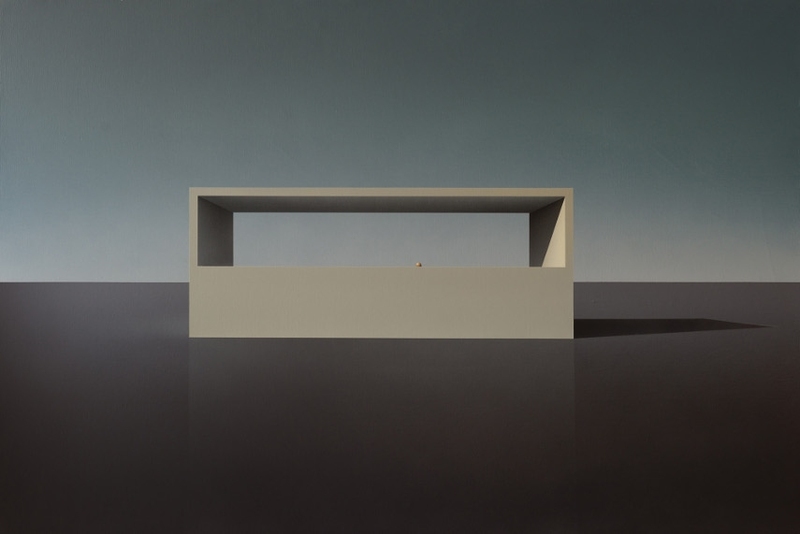 The minimalistic architecture and surrealistic environments and arrangements call to mind the influence of painters such as Giorgio de Chirico, Magritte, as well as the work of Le Corbusier. Ghadyanloo uses a specific set of repeated symbols as stairs, airplanes, and balloons alongside geometric cubes, spiral staircases, and vast walls. This Iranian artist is a master in using the light in his paintings, managing to emphasize the symbolic of his themes and create a specific somber fictional reality that conveys the contemporary Zeitgeist. Yet, he captures the ephemeral presence of hope that is so fragile that must be seen and understood in ironic terms. As an authentic and true artist, Ghadyanloo offers a fresh and inspiring vision of the modern condition. He gained a wider public attention after he was commissioned by the Ministry of Beautification of Iran to paint walls around the capital Tehran. From 2004 to 2011 to he had done more than hundred painted wall pieces that are both loved by the public and citizens and art critics and curators. It was very soon he attracted the interest of the international press, galleries like Richard Howard-Griffin, major public commissions for murals on Kings Cross and The Rose Kennedy Greenway Conservancy in 2016 in Dewey Square, Boston. In March 2017 he had the first exhibition in two years entitled Spaces of hopes in the Howard Griffin Gallery, London. But despite wide international success Mehdi leaves an impression of a modest, caring artist, committed to his art and the profound relation to the world around him. Mehdi Ghadyanloo lives and works in Tehran, Iran.